Its fall winter, and everyone is getting into the December festive season. Its also the best time of the year to make fruit based Delights as the best of fresh fruits are available this time of the year. Hence, I have decided to try and include some fresh fruits in all of my baking this season. The first fruit that I am using for baking this season would be 'Orange'. The reason I picked this fruit is I have got a personal connection with the fruit. A variety of this fruit (Kinnow) is grown in our own farms in Punjab and I visited the farms and plucked the fruits by myself! 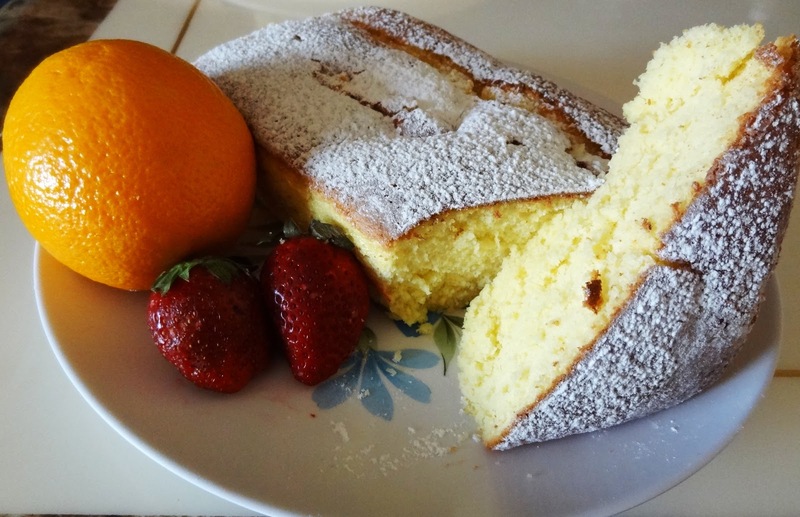 I looked for many cake recipes with Orange as the main ingredient and finally decided to make an 'Orange Chiffon Cake'. Chiffon cakes are as soft and light as a Chiffon saari (love wearing them). The cake just melts in your mouth leaving the fresh citrusy flavour lingering in your mouth for a long time. One piece is of this cake is simply not enough. The best thing about this cake is you will not get the butter taste in this cake as the recipe include flavourless oil leaving you with one flavour to enjoy...Tangy Orange. Without waiting further, lets get straight to the cake and how you can try it yourself. Preheat your oven to 170° C/ 325° F. Line a 10 inch bundt pan or 2 small pans. In a large bowl add all the dry ingredients together i.e. all purpose flour, corn flour, sugar (250 gms), baking soda, orange zest and salt. Give these ingredients a nice stir with the help of a balloon whisk. 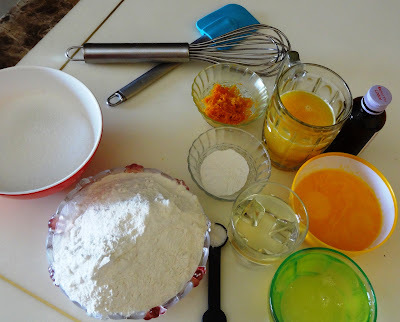 Make a well in the center of the mixed dry ingredients and add egg yolks, orange juice, oil, vanilla extract and beat with the help of your hand mixer for about a couple of minutes until nicely combined. Add lemon juice and beat until the soft peaks. Add the egg whites mixture in the batter kept aside in 3 - 4 installments and fold it gently. Once the cake is baked, invert the pan at certain height and let the cake cool completely in the pan for about 2 hours. Once cooled, put a knife/ spatula in the inside of the pan and slowly remove the cake from the pan. Dust the top of the cake with some icing sugar and sugar. Store the cake in an air tight container and store at room temperature for a few days or refrigerate it for a week. What a pretty cake idea. The orange will make me think of sunshine and warmth. Just what we need during the present snow fall, thanks.